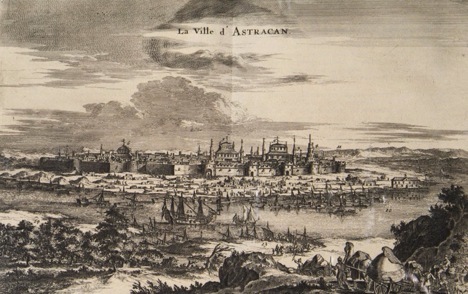 A small community of Marwaris, Sindhis and Punjabis thrived in Astrakhan from the 17th to 19th centuries. It is a popular myth that Indians first started to embrace the idea of living in Russia during the Communist days, when many Indian Socialists moved to the Soviet Union. Russian archives record the presence of Indians in the country from 1615. These pioneers with origins in Punjab, Sind and Rajasthan came to the city of Astrakhan, where a permanent trading post lasted all the way till the 19th century. In Indian Merchants and Eurasian Trade 1600-1750 (Cambridge University Press), scholar Stephen Frederic Dale writes that the Astrakhan Indian community at its peak numbered only slightly more than 200. This community was believed to be an extension of the Indian business community in nearby Persia, and part of a larger constellation that spread across Eurasia from Kandahar to Isfahan to Tabriz to Buhkara. The Indian merchants in the trading post dealt in jewellery, textiles and medicines. Surprisingly, Dale writes that “no more than half” the community in Astrakhan at its peak were actually businessmen. There were even casual labourers and those depending on the charity of the Indian community. There are stories of an Indian merchant, who went to Kazan and Moscow and successfully traded his goods, in the 1640s. However, Tsarist Russia barred foreign traders from doing business except in designated cities like Astrakhan and Archangelsk. According to Dale, the traders circumvented regulations by employing agents to trade in Kazan, Saratov and Moscow. A number of Indians worked as money lenders who financed Astrakhan Tatar and Armenian traders who would travel into smaller towns in Russia. Dale’s well-researched book even mentions the names and origin of some of the Indian pioneers in Russia. Astrakhan had a Ramdas Dzhasuev from Multan and a Talaram Alimchandov from Sind. Their names were Russianised to the extent of adding the patronymic name. It is widely believed that many of the Indian merchants inter-married with Russian and Tatar women. “There is a treasure trove of information in the Russian archives,” says Jamshed Balsara, a Mumbai-based Indian Zoroastrian who has been collecting information about the community. He is currently learning Russian and dreams of “unlocking some of the secrets of Indian life in the Russian Empire.” He adds that the population of Astrakhan would have been less than 10,000 in those days, making Indians a very visible minority. Alexander Pushkin probably saw some of these Indian merchants when visited Astrakhan and described the “mixture” he saw of clothes, faces, languages and states. The community’s decline began in the early 19th century when the Russian Empire began to tightly regulate trade by foreign merchants. This period also coincided with the destruction of manufacturing bases in India by European colonists. The trading post closed in 1840, by which time the East India Company was already occupying large swathes of land in India. According to Balsara, a handful of Indians had even settled down in cities like Moscow. “Many converted to Orthodox Christianity and married Russian women,” he says, adding that their surnames were first Russianised and then changed. He adds that a separate community of diamond traders lived in Moscow and St Petersburg right through the 19th century, but they also lost their links with India and were assimilated. Russia remains one of the few places where an Indian community actually intermarried with the locals and then altogether vanished. A greater amount of research needs to be done on the Indians who lived in Russia between the 17th and 19th centuries. There is definitely many a fascinating story about interactions, relationships and adventures of people who came and settled in a country where everything from weather, food, beliefs and customs were different from home, yet in some ways some sort of underlying and inexplicable spiritual connection existed. It would also be fascinating to know if any of the great Sanskrit and India scholars of the 19th century in St Petersburg had any kind of interactions with the remnants of the Indian community in Russia. Today, around 10,000 Indians live in Moscow and a few thousand more are spread across different parts of the country, with only St Petersburg and the capital boasting of an Indian Diaspora. Some estimate the number to be as high as 40,000, but there is little evidence to support such a figure. The miniscule Indian community is often seen as a model immigrant community by sociologists.